Let’s get this out of the way: nothing can save post-Return of the Jedi continuity but Michael Arndt. I, honestly, see no reason just yet to make any assumptions on that matter. This article is primarily a thought exercise, and for the purposes of such I will indeed be assuming a scorched-earth scenario—no Mara, no Jacen or Jaina, even a totally different resolution of the Galactic Civil War—but the points I intend to make will stand no matter what actually comes to pass. 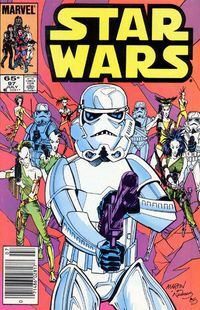 I describe this scenario as “Ultimate Star Wars” for a reason—but not, actually, to suggest a full continuity reboot; I believe a number of lessons can be learned from the example of Marvel Comics’ Ultimate universe (a modern reimagining of their primary continuity’s origins) without going quite that far. 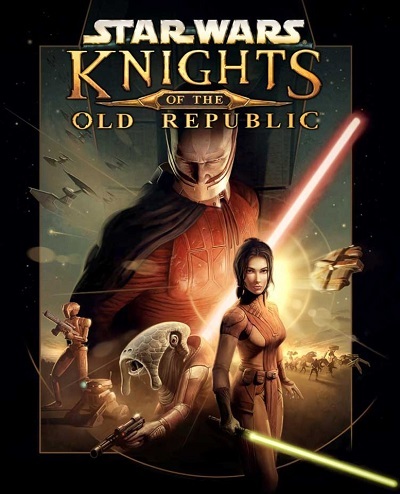 For starters, consider the Knights of the Old Republic video game. Not only is its popularity unrivaled among Expanded Universe stories, with the possible exception of the Thrawn trilogy, but the thing is a giant, hulking brick of story plopped right into the middle of what was previously a fairly empty span of time—it certainly owed a lot of groundwork to the Tales of the Jedi comics of the nineties, but I think few would argue that it didn’t run a good bit farther with the ball than Anderson and Veitch ever did. So now that we’re all on the same page…try to envision a scenario where KOTOR had to be thrown out of continuity. Not retconned, but totally thrown out; to the extent that Legacy of the Force would be if Jacen Solo were erased from history. This assumption, however, is silly for a number of reasons, not least because it’s not how businesses work—it would be tantamount to Pizza Hut coming out and asking people to please not buy breadsticks anymore. The closest thing we’ve seen to a scorched-earth reboot in recent years is, of course, JJ Abrams’ Star Trek films. But there are two important aspects of the Trek example—number one, 99% of ST canon (as I understand it) takes place after the moment at which the reboot is initiated—Kirk’s birth. Of course, the time-travel thing was just an excuse to not have to worry about contradictions, but that brings me to number two: just because this is a different timeline doesn’t mean the rest of the canon isn’t still out there. That’s another reason there will never be an overt “new continuity” announcement—just because Jacen and Jaina don’t happen, for example, doesn’t mean some version of the Thrawn trilogy couldn’t have happened, and there’s no reason to proactively obliterate Thrawn’s entire existence when a future writer might someday figure out a way to reinterpret that story. But I’m getting a little ahead of myself. Let’s go back to the Ultimate universe. When it was first starting out, they naturally jumped straight to the big stuff—Spider-Man! Wolverine! 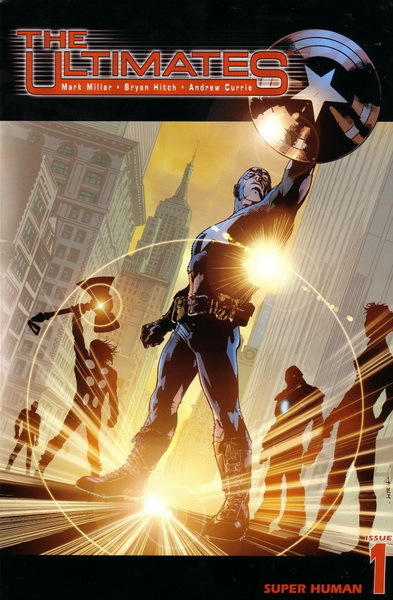 Captain America!—but as time went on, the impetus to totally shake things up waned somewhat, and for a while there, a lot of “normal” canon sort of sneaked in around the edges—it was still a new universe, but nobody really felt compelled to invent bold new versions of, say, Blade or Ka-Zar, so when they did eventually factor into a story somewhere, they were pretty much their same old selves. What I’m suggesting, and several statements from Kennedy, et al support this, is that even in the scorched-earth scenario, the vast majority of the EU setting will almost certainly be preserved as a sort of implied canon—in the same way that, the less people felt like paying attention, the more the primary Marvel universe just sort of seeped into the Ultimate universe. See what I did there? Yes, what I’m suggesting is that “implied canon” is the mandate we’ve really been living under all along—the only question is how liberally one chooses to apply it. After all: in flagrant disregard of authorial intent, Anakin did not really get Knighted six months before Revenge of the Sith. Boba Fett is not really Jaster Mereel (oh, and he didn’t die in the Sarlacc, either). The Thrawn trilogy doesn’t really take place fifty years after the Clone Wars. And Han did not really shoot first. Unless, of course, you want him to have. Which is understandable, but hey, guess what? That makes your Star Wars an alternate universe. Popular, maybe, but alternate nevertheless. This is regarded as the “foggy window” method of storytelling: continuity is never absolute, we’re never seeing an unimpeachable representation of events, and when confronted with an error, the best we can do is guess at what “really” might have happened. Circling back to Marvel again, this policy has been working perfectly well for their own thirty-year-old Star Wars series since the advent of the modern EU—if you want to believe wholeheartedly in its version of the film era, nobody’s going to tell you any different, and you may even get lucky and see a Nagai or a Zeltron once in a while. If you want to ignore it entirely, that’s perfectly fine, too—the fact that they exist doesn’t mean their first appearances have to be gospel. Fans often seem to need a gospel, though—for better or worse, they need definitive answers on a lot of this stuff, but that’s just not how storytelling works. Take the most recent, and theoretically most unblemished, Star Wars novel: John Jackson Miller’s Kenobi. There’s a scene in the book (very mild spoiler) where Obi-Wan, upon learning of Tatooine’s suns’ tendency to age people beyond their years, immediately removes his hood and stares straight into the sky. Any fan can easily spot this as an explanation for why handsome young Hollywood so-and-so Ewan McGregor turns into a weathered, frail-looking Alec Guiness in only nineteen years. Clean and simple, right? Well, when asked about the scene by Tosche Station Radio a couple weeks ago, Miller turned surprisingly demure, saying, “I throw these things out, as possible explanations” for Obi’s appearance, and “if you like that explanation—it works.” Why not just say “yeah, that’s what happened”? Because awesome as it was, Miller’s still working in a shared universe; for all anyone knows, Ewan might do an Obi-Wan spinoff film someday that gives an explanation that supersedes whatever Kenobi says (remember when Palpatine’s appearance was due to clone degradation? )—why box his story in with an absolute declaration when he could just wipe off a tiny speck of the foggy window and say “here’s what could have happened”? It doesn’t make the story any better, and it’s bad business. Of course, not even the foggiest window could completely obscure Jacen and Jaina. The intent of this piece is not to suggest that “foggy window” is an alternative to “new timeline”—it isn’t. If a multiverse is your red line for the Star Wars franchise, then I can respect that, but you might want to start packing, because there’s likely nothing to be done for you. But in the meantime, what would this mean for the rest of us going forward? The key thing to keep in mind here is that George Lucas, first and foremost, had a story he wanted to tell—everything else came second. Such a distant second, in fact, that not too long after finishing that story, he up and sold the whole franchise. Kathleen Kennedy is our master now, and unlike Lucas, she has no story; what she has is a business—one that is spearheaded by films, sure, but that also includes novels and comics. Kennedy is going to want to keep those revenue streams open, and isn’t going to let scorched earth stand in her way. So what role could novels and comics have in the Kennedy administration? Well, for one thing, as I’ve said previously—there is no Expanded Universe anymore. A great deal of the conflicts in current canon have stemmed from Lucas’ authorial whimsy, but now that the suits are steering the ship, hull integrity will have to start coming first. We’re already seeing hints of this in Hidalgo and Leland Chee’s talk of (and membership in) a new “story group” at Lucasfilm, which sounds a lot like Chee’s old job as continuity wrangler writ large. Tell me this—if the EU was totally irrelevant now, why would Chee even have a job anymore, let alone a promotion? If the films continue to be the thing that guides the ship, then I think, serendipitously, we’ve already begun seeing the face of future Star Wars publishing in smaller-scale stories like Kenobi. Per the quote that began this piece, the books and comics can be their best selves, I think, when they don’t overreach; when they focus on quality over import. 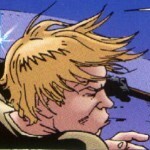 Post-RotJ has been unique in this regard in that it’s been allowed to tell stories that drastically impact the fates of the film characters, and while this has led to some of the greatest stories the EU ever told, in recent years, it’s spiraled further and further into the “constant stream of dire threats” Stradley described more than a decade ago, to the point that Luke, Han, and Leia now stand astride an entire generation of corpses, including two of their four children—characters who had to die in order to prop up the life-or-death stakes that everybody knew would never touch the Big Three directly. Now, with Star Wars being run like the business it’s always been, care can be taken to keep the film slate and the publishing slate far, far apart—if Kennedy prohibits the books from telling of Han and Chewie’s first meeting, as has famously been the case for decades, it won’t be because that’s her favorite toy and she doesn’t want anyone else to play with it, it will be because there are already specific plans in place. If she wants to put out a novel that leads into Episode VII, it will be because she already knows what that story is—and she won’t let some random TV guy overwrite it five years later, because he won’t have any greater authority than the novel guy did. And in the meantime, freed at last from the sales pressure of keeping people interested in the Big Three, the non-movie-related books and comics can tell the small stories, like Kenobi or this month’s Empire and Rebellion: Razor’s Edge, which in its tight focus on a single Rebel mission could be the perfect example of a Disney-era Big Three story. Look, nobody wants to preserve Thrawn and the Yuuzhan Vong more than yours truly—we wouldn’t have gotten here without them. But at the same time, we wouldn’t have gotten here without them, and there’s an argument to be made that the stories themselves weren’t worth where we’ve ended up. If losing them, at least in the form we currently know, means earning a true fresh start, then I think I’m okay with that—especially when so much of the rest of the EU will still be 90% safe, by virtue of being 90% ignored. And mark my words: once the Sequel Trilogy has come and gone, green shoots will emerge in their periphery. 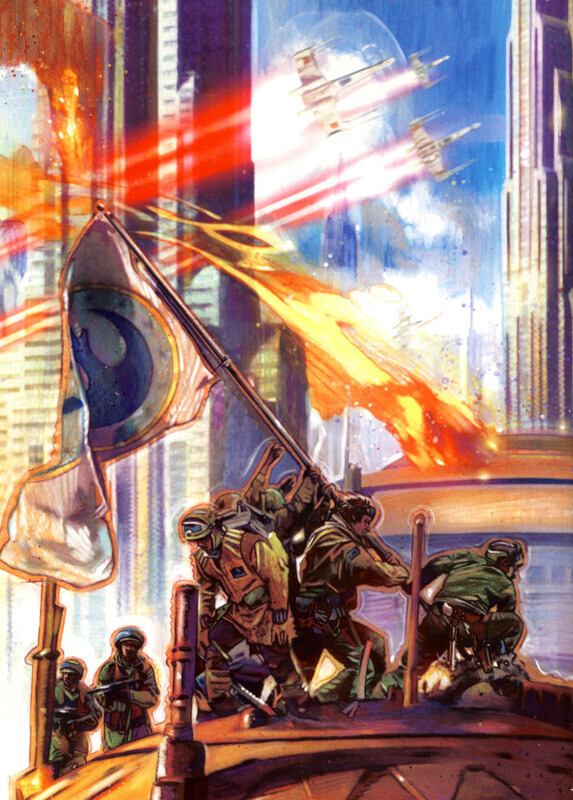 A Rogue Squadron TV series, now with the advantage of hindsight that so benefited inter-film stories like Dark Lord: The Rise of Darth Vader and Shadows of the Empire, will tell a new “reconquest of Coruscant” story. A new Young Jedi Knights series, informed not only by the EU but by huge YA successes like Harry Potter, will detail the training of Steve and Linda Solo. And maybe, just maybe, one of those shoots will be blue, with tiny, glowing red eyes. I’m comfortable with the scorched Earth policy of Star Wars canon. Mostly because it’s not so much of a scorched Earth policy as it is simply starting a new line of stories. You mentioned the Ultimates but that was the case of being able to take material they liked from the old universe into the new universe. Yes, in the new universe there would be no Grand Admiral Thrawn or Darth Revan or Mara Jade. At least unless they were reintroduced. That doesn’t mean these stories will VANISH. They just happened in Expanded Universe-1. I’m very glad I recently came across this website, I thoroughly enjoy its in-depth review of issues like these. In regards to the article, I’m one of the few that holds out hope against hope that Ardnt is writing a story that somehow, magically, incorporates the majority of the EU and allows it to become more permanent (as Coruscant did for Zahn with Lucas’ adoption). More realistically however, I’m resigned to admit that new stories need new space to breath. I am hopeful, especially with people like Pablo and Leeland still at the helm, that the rather unique concept of Star Wars EU will remain. By that I mean ensuring stories through various mediums are aligned. A background character with no lines and viewed only for seconds on screen can have a whole story devoted to him being there (Stories from Mos Eisley Cantina) or ships used in combat or planets viewed in space exist for a reason and within continuity (Essential Guide to Warfare and Atlas). That comprehensive nature of Star Wars, and it’s rocky but loving relationship with its EU, was and is what makes me such a devoted fan. It’s just so difficult to not know how those stories will be treated, especially with the temptation to jettison well-loved but already told stories of AC Crispin’s Han Solo and in place put the heartthrob of the day into a popcorn chewing movie. Are my see-saw feelings evident throughout this comment? Anyways, keep up the great writing and look forward to more in-depth analysis through to 2015! Thanks for the nice words! Yeah, I agree that we shouldn’t be totally pessimistic just yet—it’s one thing for them to not want the baggage of a Jaina or a Ben, and quite another to invent entirely new species or character backstories just to do it. I think even the worst-case scenario would still allow Bib Fortuna, say, to be a Twi’lek from Ryloth rather than a Hoosgow from Hoosgowistan. That’s a big part of the point I was making about the Old Republic material—it’s just context, and context saves them a lot of worldbuilding effort on stuff that won’t necessarily factor into their story anyway. Actually people are moving into the SW direction with Halo puting out books and comics and Star Trek having more consistency between the Roddenberryverse novels. This was a reply to Michael.